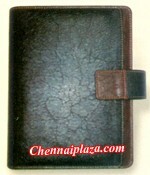 Item Description Rich looking oragnizer in black and maroon pondy leather finish offers you credit and visiting card holder, weekly and monthly planner, pages for important notes, communication file, etc. 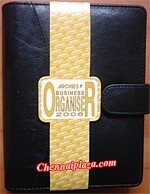 Item Description Elegant organizer in black colour, matt finish offers you credit and visiting card holder, weekly and monthly planner, pages for important notes, communication file, finance, project planner, etc. 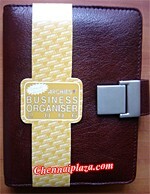 Item Description Rich looking oragnizer in tan brown colour having a metallic buckle that enriches its looks, matt finish offers you credit and visiting card holder, weekly and monthly planner, pages for important notes, communication file, finance, project planner, etc.See the bigger picture for inner preview. 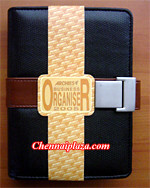 Item Description Rich looking organizer in black and brown contrast colour combination having natural finish, offers you credit and visiting card holder, weekly and monthly planner, pages for important notes, communication file, finance, project planner, etc, measures about 15 x 16.5 cms.